Lennar has acquired a 41.5-acre site in Rancho Penasquitos from its development partner and is moving ahead with construction of a 601-home community. Pacific Village is a partnership between Lennar and Atlantic Pacific Companies. Lennar has acquired the property, and the two companies will continue a multi-phase development that is expected to be completed in 2020. Located off of Carmel Mountain Road, at the northwest corner of Route 56 and Interstate 15, Pacific Village will feature 99 single-family homes, 105 triplex homes, 120 townhomes, and 277 apartments. 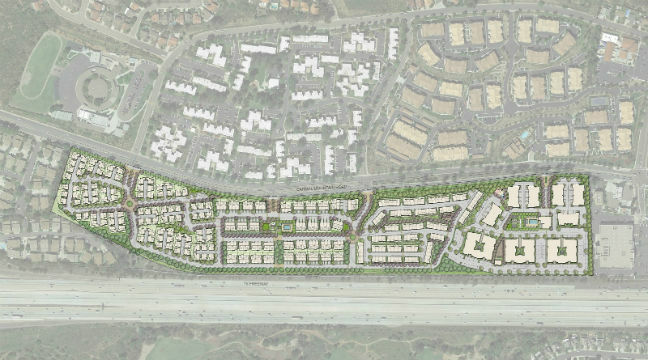 The project is taking the place of the old 332-unit Penasquitos Village affordable housing neighborhood. Pacific Village will include $10 million in community improvements, such as a bike lane along Carmel Mountain Road, new traffic signals on Carmel Mountain Drive, and a sound wall along I-15. “Pacific Village is focused on smart growth-oriented housing that is close to jobs and transit, and connectivity that promotes walking and biking to nearby amenities and activity centers,” said Bill Ostrem, San Diego division president for Lennar.